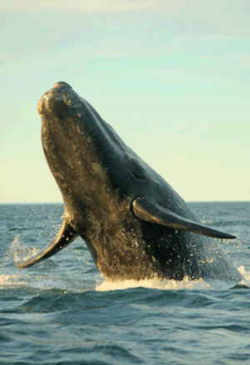 The Right Whale, (Eubalaena glacialis,) was adopted as the Georgia Marine Mammal in 1985. After being discovered that Georgia's coastal waters were a calving area for the right whale, this endangered species became the state marine mammal in 1985. 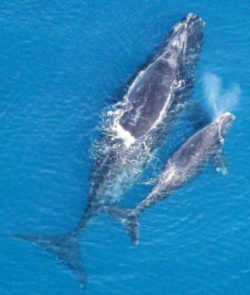 The right whale grows up to 50 feet long, has no dorsal fin and bears distinctive patches of whitish bumps on its head. It is the only great whale that is native to Georgia waters. The North Atlantic right whale (Eubalaena glacialis, which means "good, or true, whale of the ice"), is a baleen whale, one of three right whale species belonging to the genus Eubalaena, all of which were formerly classified as a single species. Because of their docile nature, their slow surface-skimming feeding behaviors, their tendencies to stay close to the coast, and their high blubber content (which makes them float when they are killed, and which produced high yields of whale oil), right whales were once a preferred target for whalers, who reportedly considered them the "right" whales to hunt. 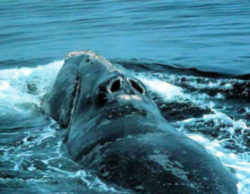 A large, blackish whale with the following features: no dorsal fin; head huge, about one-fourth of total length; baleen (whalebone) about 2 m long, 30 cm wide, and between 200 and 250 in number on each side of mouth; closure of mouth highly arched; no furrows on the throat; prominent, large, wartlike areas (called bonnets,) the one near tip of snout largest. Total length of adults, 14-17 m; weight, 20-30 metric tons. Right whales were so named by early whalers because they were the "right" whale to kill - they are slow swimmers and were thus easily caught, floated when dead, and produced large quantities of oil and baleen. Consequently, right whales were decimated early by the world's whaling industries and have yet to recover. Right whales spend spring, summer, and autumn at high latitude feeding grounds and migrate to more southerly, warmer waters in winter for mating and calving. 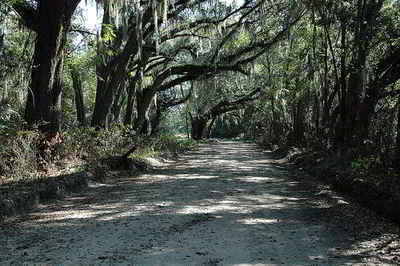 Northern and southern populations do not interbreed due to asynchronous seasons between the hemispheres. Right whales produce a variety of vocal sounds as well as percussive sounds of breaching, flipper slapping, and tail slapping. A distinctive clacking sound has been described for these whales as they feed at the surface. Termed the "baleen rattle," this sound is produced by small wavelets rattling the baleen plates when they are partially held out of water. Right whale sounds appear to differ with changing behavior and, thus, may be important in communication. As with other baleen whales, right whales probably do not echolocate. Right whales feed by skimming through concentrations of krill. They have been seen feeding at depths ranging from the surface down to 10 m although they may also feed at deeper levels. Location of krill concentrations in the water column probably determines feeding depth. After a one-year gestation period, females give birth to a single calf in winter. Calves are 5-6 m in length at birth but grow rapidly during the subsequent period of lactation, which lasts about 13 months. Calves remain with their mothers for 2-3 years following weaning and probably reach sexual maturity at about 10 years of age. 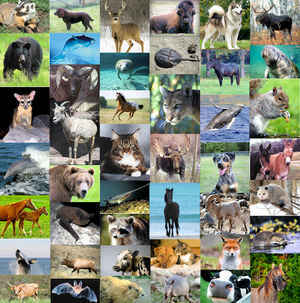 Females give birth at 2 to 7 year intervals. 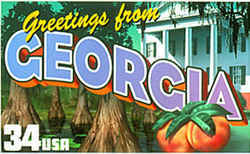 Joint Resolution of the Georgia General Assembly No. 48 (Senate Resolution No. 91). RIGHT WHALE DESIGNATED AS THE OFFICIAL GEORGIA STATE MARINE MAMMAL. No. 48 (Senate Resolution No. 91). Designating the right whale as the official Georgia state marine mammal; and for other purposes. WHEREAS, the discovery of the Georgia calving grounds is one of the most exciting discoveries in the study of marine mammal and will add to the knowledge that is vital to the survival of the species. NOW, THEREFORE, BE IT RESOLVED BY THE GENERAL ASSEMBLY OF GEORGIA that the right whale is designated as the official Georgia state marine mammal. Ga. Laws 1985, p. 747.